8-bit, lo-fi digital, and chip music-influenced sounds have become interwoven with the sounds of modern synthesis. But make no mistake: the AY3 is what you get when you build a desktop synth with the soul of a vintage 80s game console. 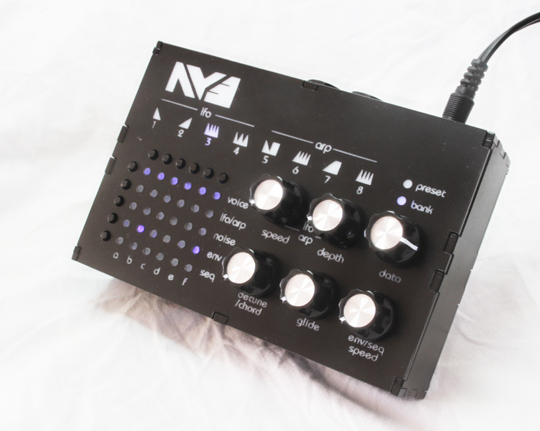 Made by Twisted Electrons, who make iPad apps and a Eurorack module, as well, the AY3 is synth hardware powered by a music hip of yore. Inside are two 8912 chips, combined for 6-voice polyphony, which give this instrument the same distinctive sound as classic game scores and other music made on the hardware. The 8912, you see, is a variant of the General Instrument AY-3-8910 (which also gives the AY3 its name). You know the sound from machines like the Sinclair ZX Spectrum, Amstrad CPC, Intellivision, and (in a licensed version) Atari ST. Incidentally, you don’t know it from some similar-sounding, competing sound chips and game machines – the NES, ColecoVision, SEGA consoles and others used chips from Ricoh and Texas Instruments. But for a raw game sound, the 8910 series is special. This isn’t warm-fuzzy lo-fi digital that can fit into other contexts; it’s really a game sound. Price: 197€, built to order. That would attract some, but what Twisted Electrons have done is come up with a clever control mechanism and modulation. You get the essentials, of course – MIDI control, hands-on knobs for adjusting timbre. But they’ve also devised some surprisingly-powerful features for adding sequencing, arpeggiators, and modulation. That is, whereas previous chip music instruments demand digging into software to program patterns, this is one that builds that creative control into the hardware. And that retro pair of chips gets some decidedly-modern power wrapped around it – complete with presets for recall – that could make this a more physical, live-improvisation-friendly instrument. Via Synthtopia, who were definitely on this first!